Bigger isn’t always better. Contrary to popular belief, small, locally owned businesses often out-perform their “big box” and Fortune 500 competition—both in outright profitability and the value they bring to consumers, workers, and communities. Unlike mega-stores and multi-national chains like Wal-Mart, these small businesses stimulate the economy by buying supplies and services locally, adapt to (rather than fight against) higher local environmental and labor regulations, and stick around for many years, often many generations. The Small-Mart Revolution details dozens of specific strategies small and home-based businesses are using to successfully out-compete the world’s largest companies. And it shows how consumers, investors, policymakers, and organizers can revitalize their own communities by supporting local businesses. Michael Shuman, an attorney, economist, and writer, is Vice President for Enterprise Development for the Training & Development Corporation (TDC) of Bucksport, Maine. 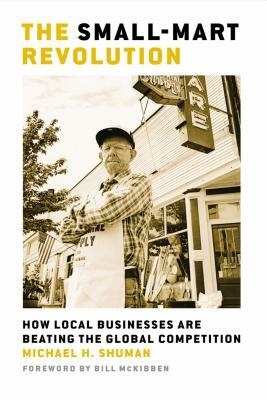 Since publication of his previous book, Going Local: Creating Self-Reliant Communities in the Global Age (Routledge, 2000), he has been considered one of the nation’s fore- most experts on locally owned business. This is a badly needed book. The Small-Mart Revolution reveals why supporting small business makes good economic sense and how they offer the only real long- term solution for the health of our neighborhoods and our nation. It will touch your heart, while showing you how to better mind your wallet. There are precious few good alternatives to the “Wal-Martization” of our communities. The Small-Mart Revolution not only provides an alternative analysis, it tells us how we can make it happen. an alternative to corporate-led economic globalization by the leading guru of local economic development. The Small-Mart Revolution provides the most important blueprint for economic development I’ve ever seen. It shows how communities can prosper by putting local constituents and businesses first. The book should be required reading for local elected officials and civil servants across America. Some of us have embraced globalization without worrying overmuch about the consequences. Others of us are fighting pointless battles against progress, technology, and capitalism. Here, Michael Shuman presents a badly needed Third Way. He says that by strengthening our local businesses and communities we’ll be creating a better capitalism and a better world. And he backs it up with logic, examples, statistics, and passion! This is the kind of book that could launch a whole new social-political movement. Michael Shuman has done it again. He shows the power of grassroots economics—not as mere theory about a future world— but as real people, today, creating an equitable economy from the grassroots up. This book will revolutionize your thinking about “development.” Do yourself and all of us a favor by reading it and then acting on it. The world is about to become a larger place again. Globalism is toast. Caught up in raptures of credit-fueled discount shopping, few Americans realize how profoundly our society is about to change. We are sleepwalking into a permanent global energy crisis that will compel us to live much more locally than we have for generations. We face a desperate need to reconstruct local networks of economic relations—and we should have begun this great task yesterday. This is an invaluable guide to how we might accomplish this. As global markets explode, Michael Shuman offers a compelling alternative for growth towards a healthier civil society. Anyone interested in the consequences of globalization dominated by multinationals should read this book.